This slot oozes class, from the symbols on the reels through to the satisfying ‘clunk’ as they fall into place. 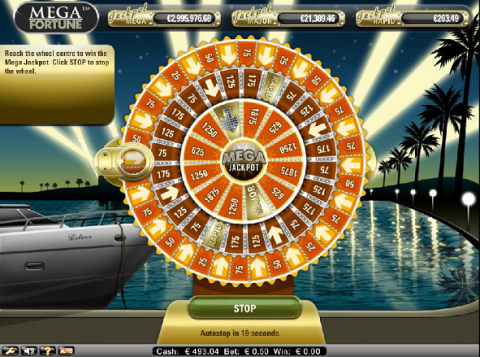 Mega Fortune from Net Entertainment holds the current world record for the single biggest online slot jackpot – an astounding €17.9 win. The progressive jackpot is usually well over €2 Million, and is linked between casinos which host this slot – ensuring that it grows very quickly. This is not the newest slot, though it is very easy to play, and has smaller jackpots as well as the big one via a spinning wheel bonus game. You’ll find the following details in my Mega Fortune review: first of all the basics are covered, including the day-to-day wins, bets and lines. Next the bonus game, along with the jackpots you can win are discussed. You’ll find some info on device compatibility, and then my final thoughts on how this game matches the other progressive jackpot games online at the end. The basis of this game is a 5 reeled, 25 line video slot. You can choose the number of lines (more recent NetEnt titles skip this part), the level (bet multiplier) and the size of your coin. The smallest bet is 25c, with the max 25 lines, 50c bets and level 4 being €50 per spin. You can win the jackpot with any amount, though your chances are proportional to the bet size you choose. All of the standard winning symbols are the clichéd signs of wealth. The best paying are the stretch Limo, watch and jeweled money clip. The lower payers are rings with letters representing the playing card symbols. There are wild symbols with a speed boat symbol, which pay out 10,000 coins for 5 – in addition to substituting for all other symbols except for the bonus and scatters. Scatters are not the highest paying (100 coins for 5 anywhere). They do start a free spins round if you hit 3 or more though. You can retrigger these, and will have a multiplier of up to 5x for the wins you hit – which can add up to a welcome bonus. The bonus symbols are what you want to see in this game. Specifically these need to be in the first reels from the left on an active win-line. If you do hit these wheel signs, then you are taken to the bonus game and a chance of winning the big progressive jackpot, or the ‘Major’ or ‘Rapid’ smaller ones. This game is made up of 3 concentric wheel of fortune type reels. You play the game by hitting a stop button below them (or waiting for the count down and auto spin if you prefer). The wheel then comes to a stop with the circle on the left showing the landing spot. This can either be a cash amount (in coins) or an arrow which moves you inward to the next wheel. The process repeats, though the cash amounts are bigger and there are only 4 arrows pointing into the next wheel. 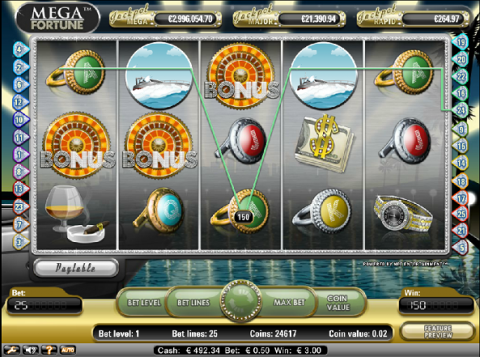 You can hit the Rapid jackpot on the 2nd level, which is usually in the €100’s or low €1000’s. The3rd wheel is really heart in the mouth stuff, you can hit the big progressive here if the wheel lands on the big jewel studded arrow. There are also other cash amounts, plus a slot for the middle (Major) jackpot – which can be in the 10’s of thousands. The jackpot is won every few months, and there are a lot of millionaires out there already thanks to this slot! This game has a specific mobile version as part of the NetEnt touch range – which pioneered games designed to operate on both iOS (Apple) and Android devices. There is no traditional PC or Mac download for Mega Fortune (or any other NetEnt slots). These work responsively in your browser, adapting to your screen size and mouse / touch screen controls. If you love slots, then playing this game is one for the ‘must try’ list (like Mega Moolah). It is not the most feature packed of games, and in some ways does feel a little dated already. What it does have is the balance of solid, classy game-play – and of course the chance to win a huge progressive jackpot. Who knows, the next record breaker could be you! You can check out Mega Fortune, and the whole range of NetEnt games over at the multiple-award winning Mr Green at www.mrgreen.com!